North American Redemptorist students gathered at Notre Dame Retreat House in Canandaigua, N.Y., during the fourth week in May for formation, learning, building friendships, and—for some—the renewal of vows. 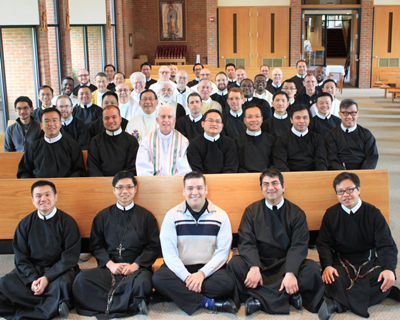 Redemptorist students from throughout North America met at Notre Dame Retreat Center in Canadaigua, N.Y., May 21 through 27, along with confreres in formation and vocation ministry. During the annual gathering, each day began with a two-hour workshop by Father Dennis Billy, C.Ss.R., on the life and times of St. Alphonsus. At the closing Mass, Father Stephen Rehrauer, provincial for Denver, and Father Gerard Knapp, provincial vicar for Baltimore, received the renewal of vows of some of the Redemptorist students. This year marks a transition for students in formation, as those who have been studying in Chicago and Boston will now complete their theological education at the Oblate School of Theology in San Antonio, Texas. Father Peter Hill and Father Mick Fleming will lead the community, and the students’ education will be conducted in English and Spanish. In the Bronx formation program, Brother Gene Patin will continue in his role, joined by Father Bob Wojtek and Father Joe Ngo. The formation programs at the University of Dallas and the University of St. Thomas in Houston, where courses are conducted primarily in Vietnamese and English, will continue. Father Francis Dang will remain in a leadership role with others on the formation teams in Texas.